The Youth Empowerment and Innovation project (YEIP) is a 3-year Erasmus+ funded project (KA3 - Policy Experimentation) that aims to design a positive policy prevention framework for tackling and preventing marginalisation and violent radicalisation among young people in Europe. Recognising the urgent need to tackle youth radicalisation, over the next three years, Youth Empowerment and Innovation Project, led by young people will construct and test innovative policy intervention models founded on the principles of positive psychology and Good Lives Model (GLM). It will be implemented through the construction and field validation of tools (YEIP PREVENT model/ interventions, toolkit, training) in 4 environments (schools, universities, prisons, online) in 8 EU member states. Involving 20 partners and led by the youth-led NGO, IARS, YEIP will lay the foundations for systemic change at the national level and EU levels. The ultimate objective is for the project to help address the KA3 PT7 aligned with the EU Youth Strategy’s objective of preventing the factors that can lead to young people’s social exclusion and radicalisation. The success of this youth-led project will demonstrate to European citizens the leadership and determination of EC institutions in rooting out the reasons that lead to young peoples’ marginalisation and radicalisation, firming up in this way trust and confidence. There is a social need to have more effective youth policies that can enhance young people’s social inclusion and minimize the risk of radicalization with greater ‘buy in’ from youth themselves. 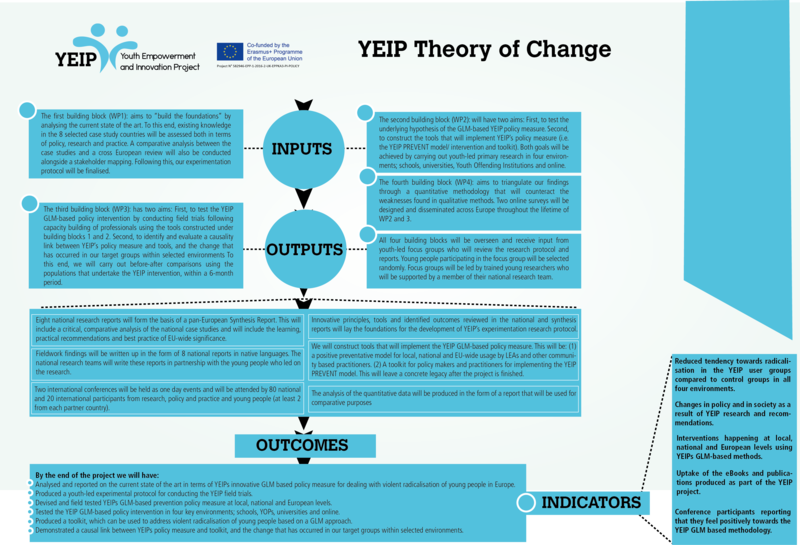 YEIP will construct and test an innovative policy intervention that will generate a set of actions that will help address this need at the local, national and European levels. This measure is founded upon the Good Lives Model (GLM) and positive psychology, which assumes that we are goal-influenced and all seek certain ‘goods’ in our lives, not ‘material’, but qualitative, all likely to increase or improve our psychological well-being (Ward, Mann and Gannon 2007). Through the use of multi-disciplinary tools, we will construct tools that will test and implement this measure at the local, national and EU wide level. The ultimate objective is for the project to help address the KA3 PT7 aligned with the EU Youth Strategy’s objective of preventing the factors that can lead to young people’s social exclusion and radicalisation. Existing approaches are constructed within the Risk Need Responsivity (RNR) model for prevention. Developed in the 1980s by Andrews, Bonta and Hope (1990), RNR’s focus is on reducing and managing risk as well as on studying the process of relapse. Pathology-focused research and intervention have consequently been developed as tools for RNR based approaches to rehabilitation. According to Maruna (2006) and Gavrielides and Piers (2013; 2015), RNR is now challenged at practical, policy and financial levels. They argued that concentrating on criminogenic needs to reduce risk factors are not a sufficient condition when it comes to young people. McAdams (1994; 2006) argues that integration and relatedness for young people are crucial in encouraging desistance from violence and radicalisation. Politicians and the public also seem to agree with the extant literature. For instance, the UK Justice Secretary said that prison often turns out to be “a costly and ineffectual approach that fails to turn criminals into law-abiding citizens” (Travis 2010). Financially, the RNR has not proved viable either. In the UK, putting one young person in prison costs as much as £140,000 per year (Knuutila, 2010). YEIP will turn the RNR approach on its head. Instead of managing young people as risks, our policy measure will focus on promoting the talents and strengths of vulnerable young people and through this help develop positive identities. The extant literature has defined these as being “the internal organisation of a coherent sense of self” (Dean 2014). The GLM operates in both a holistic and constructive manner in considering how offenders might identify and work towards a way of living that is likely to involve the goods we seek in life, as well as a positive way of living that does not involve or need crime (Scottish Prison Service 2011: 36). In this process the argument is that the model works towards a positive, growth-oriented change in life where an offender works on the development of the values, skills and resources towards life based on human goods that is a necessary counter-balance of managing risk alone (Ward, Mann and Gannon 2007: 92), i.e. risk is managed as well as seeking to develop positive life alternatives. Our project is based around a theory of change model that we have created to ensure that the project has a positive impact on marginalised young people who are at risk of violent radicalisation. The partners are currently progressing with the second phase of the project and have begun training young researchers to work with their peers to research current thinking in order to inform the production of the YEIP toolkit. Youth work and researcher training took place at IARS International Institute’s offices across three days: 17th, 18th and 24th April. 7 members of our youth advisory board participated, as well as 7 students of local schools and universities. Each training session consisted of two hours and gave an overview of YEIP, methods of working with young people and conducting youth-led research. All of the young people were given an extensive reading list for homework and more information to make sure they were ready to start work! Finally, members of the young researcher team will meet on the 9th May to reflect on their learning and prepare their focus group and interview techniques. Even though researcher training has begun in the UK, however if you are interested in joining as a researcher on this project, you can still get involved by e-mailing Emily Lanham to register your interest.